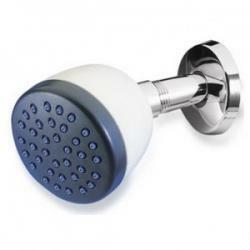 Fitting a shower filter will provide many benefits at a low cost. Easy to fit and cheap to maintain they are becoming increasingly popular as realisation of the problems with chlorinated water becomes more widespread. Enjoy clean, safe chlorine free shower water and feel softer skin & hair. Our selection of Shower Filters use highly effective media and filtration to reduce chlorine in high temperature shower water. They produce non-scaling, mineral enriched, anti-oxidant, alkaline water for health and well being. Their effect on the health and appearance of the hair is one of the most obvious & immediately noticeable benefits but their benefits on long term health may be even more important. Chlorine, a highly active chemical (the main ingredient in WW1 mustard gas), in particular can be a greater problem in showering than when it's consumed in tap water. The reason for this is that chlorine vaporises at temperatures lower than normal shower temperatures and is breathed in, albeit in low concentrations, allowing it to be absorbed directly into the bloodstream. This does not present a problem where occasional, but once or twice daily for our entire lives can only put our health under unnecessary stress. The good news about chlorine however is that it is easily removed and a chlorine free shower is simple to achieve by employing an easily fitted shower filter, a simple solution which is within the range of everyone. Fitting is ever-so simple and as easy as screwing on a light bulb! You can even take them on holiday with you so you can have a shower free from bacteria and other contaminants. If you want to remove these chemicals for the bath too, we have a great range of Whole House Water Filters, designed to filter all the water in the entire house. H2O Inline Shower Filter SHH-IL-CP Be kind to your skin and hair with the H2O Inline Show.. The Paragon Chrome Hand Held Shower Filter with Massage Function The Parago..
Paragon SFRC1 Shower Filter Replacement Cartridge The Paragon SFRC1 reduces.. The Pentair Filtrix Shower Filter The Pentair Filtrix Point-of-use filter has a state-.. Replacement filter for the Puricom Ivory GAC KDF Inline Shower Filter (2 Pack) ..
Vitafresh Advanced Shower Filter Replacement Filters - 3 pack The use of vitamic C in..